Sensors on players will tell us exactly where they were in real time. 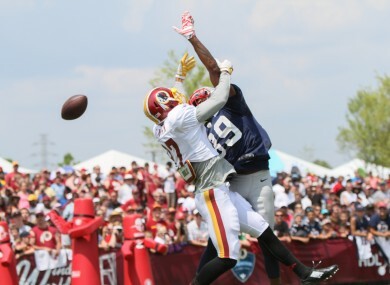 New England Patriots CB Brandon Browner breaks up a pass to Washington Redskins WR Cody Hoffman during an NFL Football training camp. IF YOU’VE EVER sat on your couch on Sunday night watching NFL and wondered about the exact speed of the wide receiver that just torched your team’s secondary, or exactly how little separation he needed to get open for that first down catch, pretty soon you’ll be able to know these stats without moving. According to USA TODAY Sports, players will begin wearing two oblong sensors the size of a €1 coin on their shoulder pads, part of a new technology the NFL is implementing this season with the help of Zebra Technologies, a radio-frequency identification (RFID) company. To complement the sensors, the NFL is also working to install receivers in 17 NFL stadiums before the start of the upcoming season. Per USA TODAY, Zebra Technologies’ receivers (placed between the bands between the upper and lower deck around the stadium) will track players’ locations and instantaneously upload information to a server hub. If this doesn’t seem amazing yet, here’s why it is: the data will also be uploaded to the NFL’s cloud. Once it’s on the cloud, TV broadcasts can use it practically in real time, meaning a completely enhanced viewing experience with complementary graphics and statistics on screen. Fans will be able to track a player’s acceleration, see if he actually was as wide-open as he looked, etc, while also watching the game unfold. It could be the biggest change to watching football since the yellow first-down line. This season marks the beginning of the live testing phase; all 15 teams that will host Thursday Night Football, along with a two more, are implementing the technology. Pretty soon, teams will have access to in-game data, too, and improvements to Zebra’s sensor technology could mean advancements like a sensor on the football that could track whether or not it crosses the goal line. “For those of us that are coaches from our couches, we’re like, ‘Oh, come on! That guy was open!’ Maybe he was and maybe he wasn’t,” Jill Stelfox, general manager of Zebra’s location solutions division, told USA TODAY. Email “A new technology coming to the NFL will revolutionise a fan's viewing experience ”. Feedback on “A new technology coming to the NFL will revolutionise a fan's viewing experience ”.